I’m seriously freezing right now, and it’s only 57 degrees outside. Yes, I realize a lot of you have all kinds of snow and freezing temperatures and you are probably laughing at me. Your blood definitely thins once you get adjusted to warmer weather. Just last week we were sitting on the beach enjoying 80 degrees and sun, so yes, my body is freezing right now, even if it isn’t that cold here. I’m kind of scared for our trip up north to see family for the holidays. My sister-in-law has been sending me pics of the weather there and laughing her head off at me because she knows I’m a big baby when it comes to cold weather. Trust me…I’m packing an extra bag with all our winter coats and extra layers for me. If you need me, I’ll be the snowman inside by the fire trying to warm up. 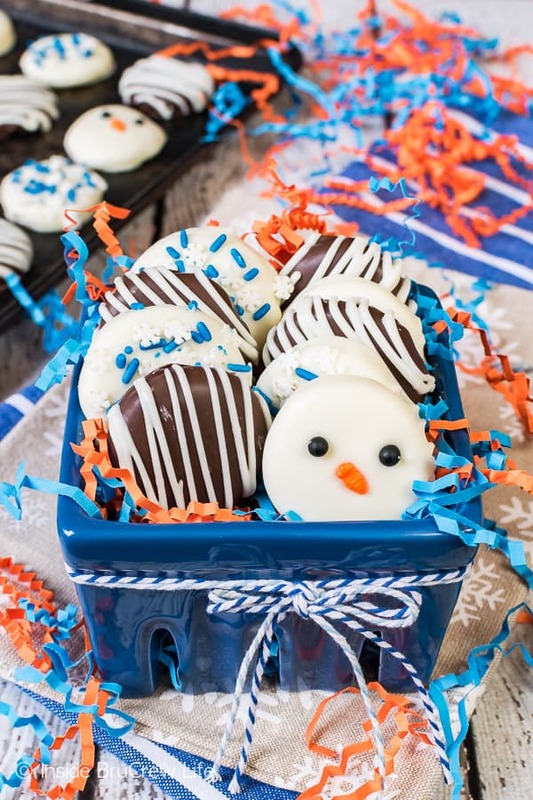 The only way I like to see snowmen is when they are on a dessert tray and made of sugar. 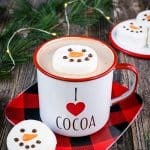 Actually, I was quite surprised to see that I have never done a snowman treat in all the years of sharing recipes. The closest thing I have are these marshmallow frosty hats that I made quite a few years ago. 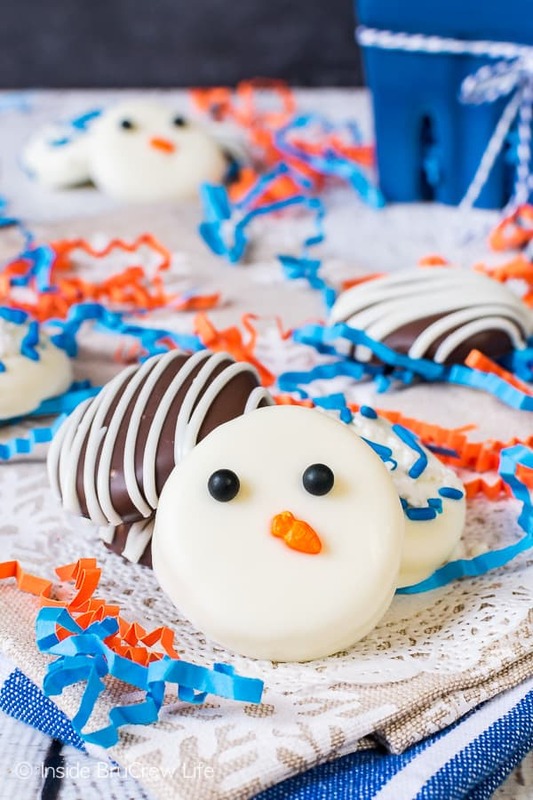 Since I found a bag of snowman eyes and carrot noses at Walmart, I had to incorporate them into a fun little snowman candy. 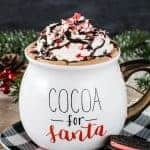 Usually I just make lots of cookies and fudge to hand out at Christmas time. For some reason I always tend to make more candies at Easter time instead. This year I was looking at this chocolate peppermint fudge, and I decided to use the top layer in a cute little candy. I modified the recipe just slightly and rolled the mixture into 60 balls. Just press each ball into your hands until you have the size and shape that you want your peppermint cream patties to be. I froze the patties on two pans because it is easier when it is time to dip them in chocolate. 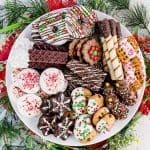 If you do not freeze them, be careful as you are dipping because they can fall off and break easier when they are soft. 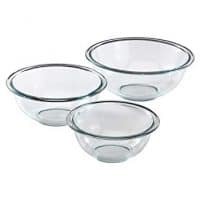 When you are ready to dip your candies, melt your chocolate in a microwave safe bowl. I always start with one of the chocolates and one pan of frozen patties. Keep the other pan in the freezer and rotate them out as the candies start to soften. If you are adding sprinkles to the tops of the candies, make sure you dip and sprinkle immediately after each one. The chocolate will set up very fast because the patties are so cold. If they set up too quickly to add the sprinkles, don’t worry about it. You can always drizzle them with more chocolate and add the sprinkles then. 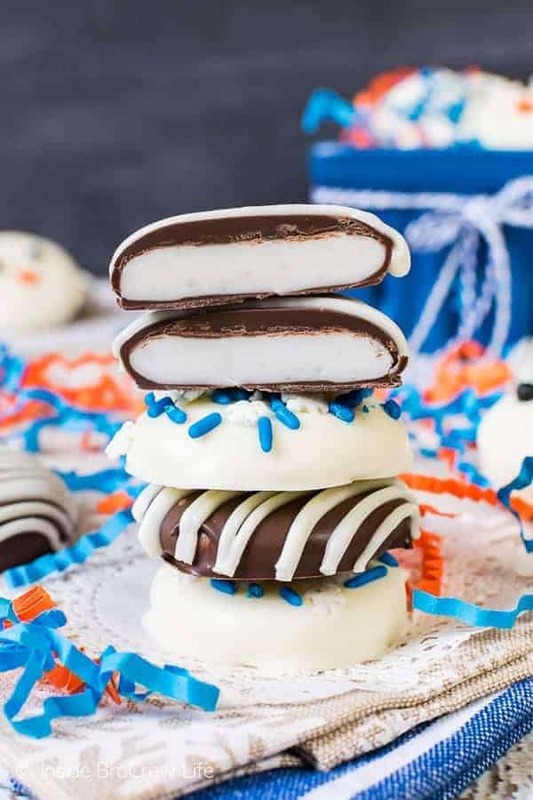 Different colored chocolates and sprinkles make these peppermint cream patties stand out on cookie trays. I dipped half the patties in white chocolate. 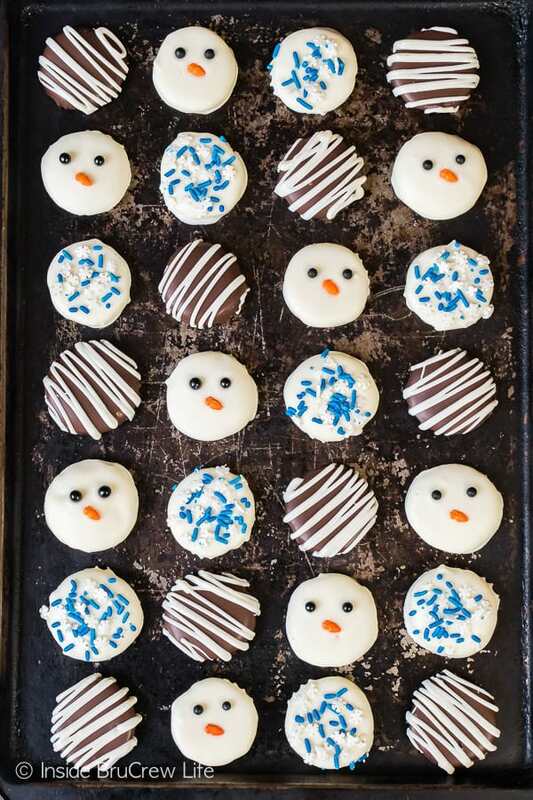 On half of those I added snowflake sprinkles and on the other half I did cute snowman faces. I used dark chocolate on the remaining half. After the chocolate set up, I remelted the extra white chocolate that I had in the bowl from the first batch and spooned it into a plastic Ziplock baggie. Cut one tip off and drizzled it quickly over the tops. 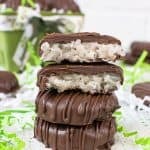 These Peppermint Cream Patties are a fun and delicious treat to add to your cookie trays this Christmas. 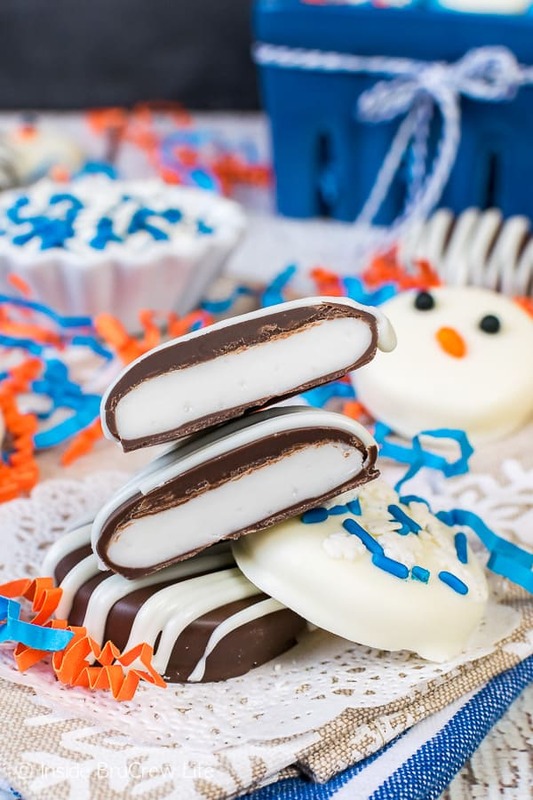 The candies are easy to customize with different colored sprinkles and chocolate. 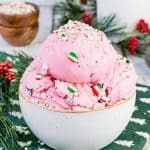 Beat the butter, marshmallow cream, peppermint, and salt until creamy. Slowly add the powdered sugar and water until a dough forms. Roll the mixture into 60 even balls. Press each one into a round disc. Place the patties on the prepared pans. Freeze for at least 30 minutes. 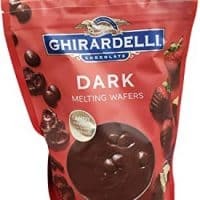 Place 1 cup of dark chocolate melts in a microwave safe bowl and melt according to the package directions. Dip half the frozen patties in the chocolate, one at a time. Place on another sheet of parchment paper to set up. Melt more chocolate, if needed. Melt 1 cup of white melts in a microwave safe bowl and dip the other half of patties one a time. Place on parchment paper and add sprinkles right away. Melt more chocolate, if needed. 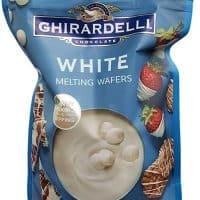 Heat the remaining white chocolate and spoon into a Ziplock baggie. Cut one corner off and drizzle over the dark chocolate patties. Let set. Store in a sealed container on the counter.